Located about 1.1 billion light-years from Earth, the Teacup's host galaxy was originally discovered in visible light images by citizen scientists in 2007 as part of the Galaxy Zoo project, using data from the Sloan Digital Sky Survey. Since then, professional astronomers using space-based telescopes have gathered clues about the history of this galaxy with an eye toward forecasting how stormy it will be in the future. This new composite image contains X-ray data from Chandra (blue) along with an optical view from NASA's Hubble Space Telescope (red and green). The "handle" of the Teacup is a ring of optical and X-ray light surrounding a giant bubble. This handle-shaped feature, which is located about 30,000 light-years from the supermassive black hole, was likely formed by one or more eruptions powered by the black hole. Radio emission -- shown in a separate composite image with the optical data -- also outlines this bubble, and a bubble about the same size on the other side of the black hole. 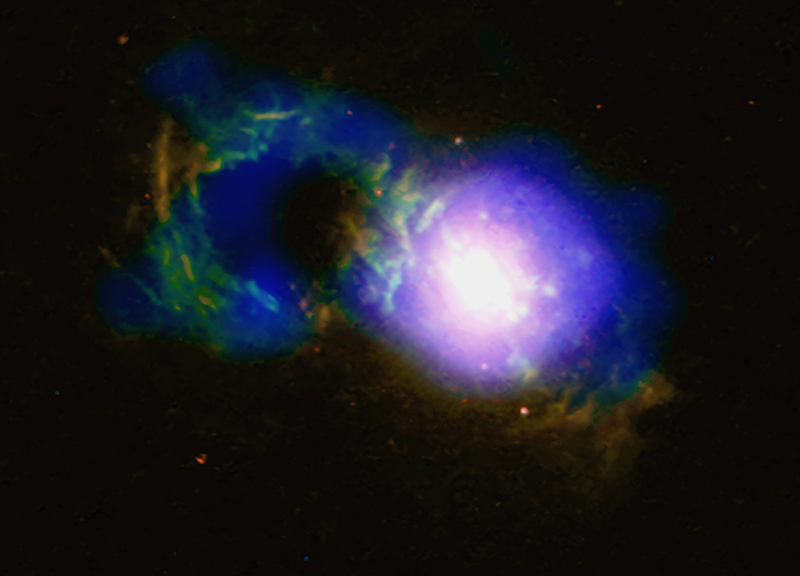 Reference: "Storm in a Teacup: X-ray View of an Obscured Quasar and Superbubble," G. B. Lansbury et al., 2018 Mar. 19, Astrophysical Journal Letters [https://iopscience.iop.org/article/10.3847/2041-8213/aab357, preprint: https://arxiv.org/abs/1803.00009]. The authors are George Lansbury from the University of Cambridge in Cambridge, UK; Miranda E. Jarvis from the Max-Planck Institut für Astrophysik in Garching, Germany; Chris M. Harrison from the European Southern Observatory in Garching, Germany; David M. Alexander from Durham University in Durham, UK; Agnese Del Moro from the Max-Planck-Institut für Extraterrestrische Physik in Garching, Germany; Alastair Edge from Durham University in Durham, UK; James R. Mullaney from The University of Sheffield in Sheffield, UK; and Alasdair Thomson from the University of Manchester, Manchester, UK. Fancy a cup of cosmic tea? This one isn't as calming as the ones on Earth. In a galaxy hosting a structure nicknamed the \"Teacup,\" a galactic storm is raging.